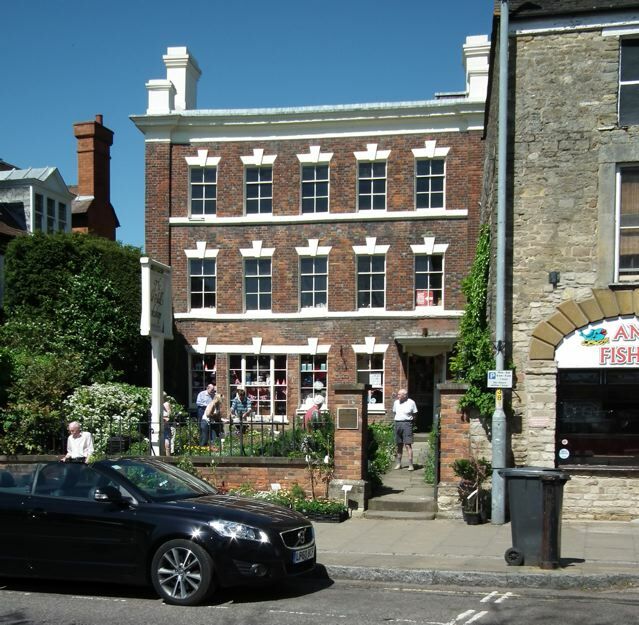 Here’s a warts-and-all photograph of one of my favourite buildings in Brackley, a Northamptonshire town that some of you will know as (I think) the market town in Flora Thompson’s Lark Rise to Candleford. I’m attracted to this house for various reasons. First of all for the charming, if pulled-about, mid-18th century front. It’s all very restrained – the brick pilasters running up each edge of the facade are easy to miss; the pale bands beneath the windows are plain and simple; the off-centre doorway is modest. It’s not grand Georgian architecture, but the kind of satisfying facade that was put up by the dozen in the 18th century. And you notice I say ‘facade’. This is another example of the effect I noticed in Aylesbury a couple of posts ago: a Georgian brick front applied to an earlier house – in this case, a 17th-century building of rubble masonry. There’s another reason I always stop here when I visit Brackley. This building is now a bookshop, and apparently a thriving one. This weekend it was also hosting a plant sale in the front garden, hence the unusually busy scene behind the railings. Inside it was calmer but there were customers browsing the mix of new and secondhand books, and buying too. As both new and used bookshops fold under the combined pressure of Amazon and ABE, perhaps more High Street stores should adopt the practice, still quite unusual in Britain, of selling both old and new books. Here at the Old Hall Bookshop, with its ample shelves of art, architecture, topography, and literature (and many more subjects: those are just the shelves that interest me), it certainly works for me. If you’re familiar with the map of England you’ll know how the country’s largest river, the Severn, curves its way through Gloucestershire, its most dramatic set of bends almost forming an oxbow lake about eight miles below Gloucester. Inside the neck of land enclosed by these bends is the village of Arlingham, and if you go through Arlingham you find Passage Road, a mile of narrow, low-lying roadway, bounded on either side by meadows and ditches, running arrow-straight towards the river. At the point where the road ends is the Old Passage, an early 19th-century house, now a very good seafood restaurant. 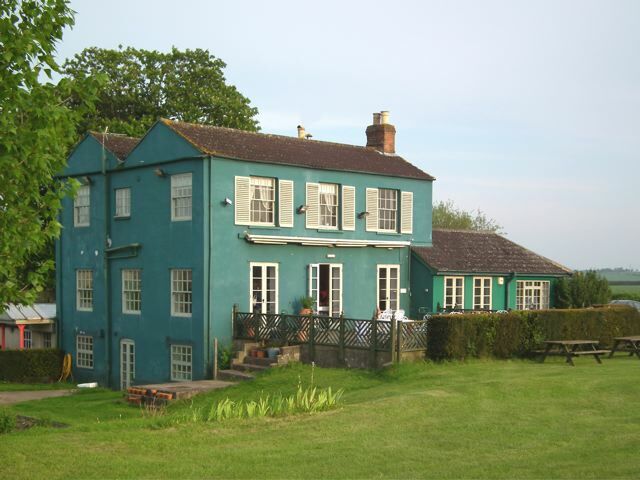 The exterior of the building is painted a curious colour on the borders of blue and green, which either blends into the surrounding landscape or stands out brightly, according to the light and the time of day. The large windows of the Old Passage look out across the Severn to the small town of Newnham on the opposite bank. This was once the site of a ford across the river. These days on the Ordnance Survey map about half the width of the river at this point is marked as “Mud and Sand”, but I wouldn’t want to try and walk across this dangerous river with its huge tidal range (I’ve written more about the Severn and its banks here). The building’s large windows also make for a light interior, good for displaying pictures and on Sunday I was there for the private view of the art exhibition “earth.wind.water.sky” – an inspiring collection of prints, paintings, photographs, and other works hanging on the walls of the restaurant. The exhibition, which includes many works that portray the river or take inspiration from its water, light, and atmosphere, runs to the end of the month and is well worth a visit for anyone in striking distance. This is an example of something that happened a lot in the 18th century. 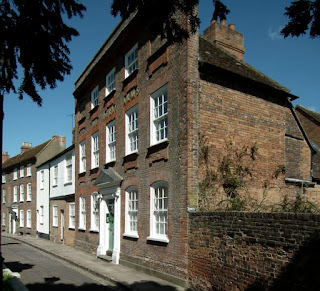 There was a substantial building in St Mary’s Square, Aylesbury, overlooking the churchyard. It was probably a house although later the building became a public house, the Derby Arms. In the Georgian period its owners were followers of fashion, but they didn’t have the money, or the inclination, to rebuild their house in the latest style, with a symmetrical front in two-tone brickwork, sash windows, and a panelled door set in a classical door case topped by a triangular pediment. So they did what lots of middle-class townspeople did: added a facade with all these features and more to the front of their existing house. Seen directly from the street the building looks like a Georgian house and the details – the door case with its Ionic capitals, the windows with ‘aprons’ beneath the sills, the shaped head of the central window, the deep cornice at the top – are impressive. Only the top floor, where there are only three windows instead of five, with brick panels instead of windows at either end, looks slightly odd. And viewing the building from the side, we see why: the upper level of the facade hides a pitched roof, leaving no space for windows at either end of the top floor. 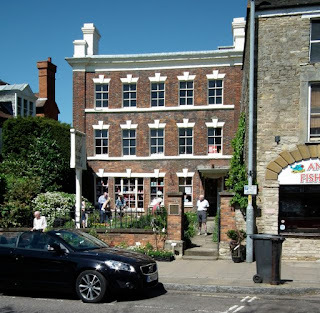 If there had been a neighbouring house, as there is on the far side of the Derby Arms, the contrast between the facade and the rest of the house would be virtually invisible from the street. Maybe there was such a house once. But now there’s just a garden wall, and this episode in the building’s history is clear to see. In the early 1900s London’s transport was starting to turn to electricity for its power. The early underground trains had been hauled by steam locomotives, but few people liked the clouds of steam and sooty smuts that plagued the station platforms and the need for ventilation meant that underground lines had to be built near to the surface. Using electric power meant that deeper lines could be constructed, beneath parts of the city where sub-surface lines were impossible to build. So as the underground (and the tram network) began to hook up to electricity, power stations were required, and one was built in Greenwich. 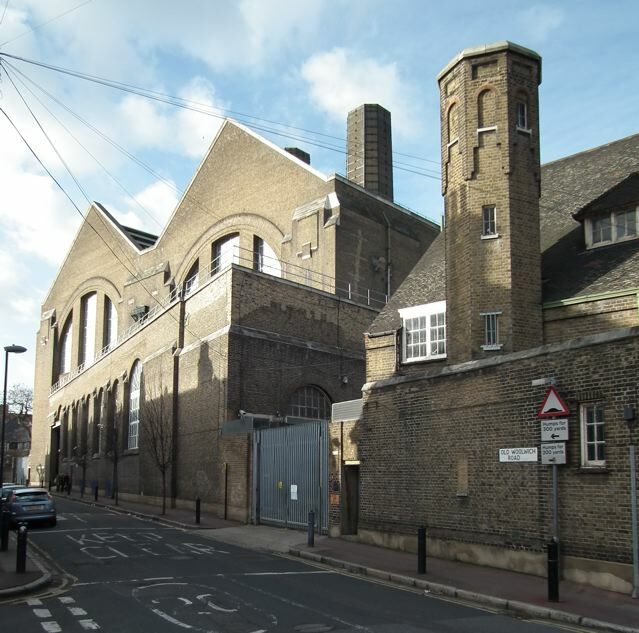 The Greenwich Power Station was originally fitted with four large steam engines driving alternators. The engines were huge and so required the vast big-windowed sheds that can still be seen poking up above the urban low-rise of Greenwich and Woolwich. The building was put up in two phases, in 1902 and 1910, and the design was the work of the London Country Council architect’s department – they must have been proud of the pair of enormous Diocletian windows that light the cavernous engine rooms. When the 1910 phase of building was completed, turbines – the latest generating technology – were installed in the new part of the building, and eventually the steam engines were removed and more turbines were installed. There are still turbines in the power station, and the equipment is kept in working order and occasionally run as the power station stands by as a back-up facility for the Underground. Compared to some power stations, such as Bristol’s Tramways GeneratingStation, this is a plain and simple building, but imposing nonetheless. The chimneys and windows can hold their own against the background of the towers of Docklands. The Power Station has a small tower of its own, the small octagonal turret on the right of my photograph, but no source I have found can explain what it is for. Sights like this bring back memories of a time when filling up did not involve a major hit on the credit card account and when, with relatively few cars on the road, thoughts of environmental costs were limited mostly to the effects of exhaust fumes on the air quality in big cities. A time, too, when the roads were quiet enough for the pumps to be right on the street, like these. There was no forecourt – you just pulled up and the supply line was long enough to reach your vehicle. 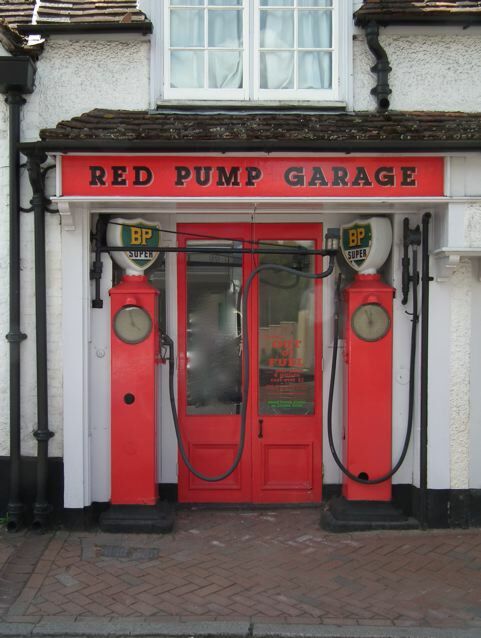 These two pumps are on the main street in the centre of Great Missenden, not far from the museum devoted to the life and works of the village’s most famous resident, Roald Dahl. Apparently the Red Pump Garage features in one of Dahl’s books. The bright red pumps very much look the part and presumably their survival is at least in part a tribute to the celebrated author. The notice on the door says they have been “Out of fuel” since eight gallons cost more than a litre. In other words, the place has been closed for years – but it is still a repository of memories. *Not my joke, alas. This line has already been used as the title of a book on gas stations and by manufacturers of ballet shoes. There are ruined castles all over England and their walls and towers, fragmentary as they often are, give us quite a good idea of the ways in which medieval fortifications developed. But there’s one part of the castle that has often vanished completely: the main domestic building or hall. In peace time the hall was the heart of the castle. It was a combination of dining room, reception room, office, and even bedroom. It would be built inside the castle walls so didn’t itself have to be heavily fortified. There’s a magnificent hall at Stokesay Castle in Shropshire, but Stokesay isn’t a true castle – it’s a fortified manor house. What did the hall of a full-blown castle look like? One answer is found at Oakham where the castle’s hall has survived while the rest of the castle has disappeared. This hall is a magnificent aisled building, probably constructed in the 1180s or thereabouts, a spacious interior with two sets of four round arches separating the aisles from the central space. One can imagine Walkelin de Ferrers, the lord who held the castle in the late-12th century, presiding over banquets and meeting dignitaries in this large room, which, with its decorated arches and carved capitals is the last word in the domestic design of the period. 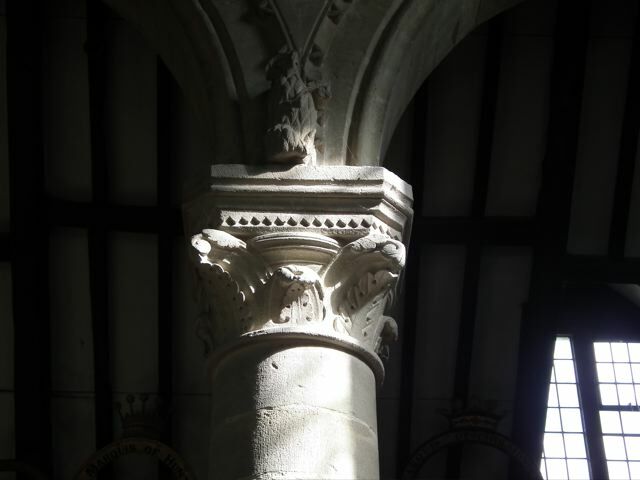 The capitals are especially beautiful. They are very similar to those in the choir of Canterbury Cathedral, which was remodelled between 1175 and 1185 under two notable masons called William – William of Sens and the man known as William the Englishman, to distinguish him from his French colleague. Perhaps one of the masons working for the Williams was called up to Oakham to design the hall and supervise its construction. The carved capitals, with their mouldings and leaf decorations, caught the light beautifully on the day I visited. The hall is also witness to an odd tradition. For centuries the Lord of the Manor of Oakham has required any visiting peer of the realm (or member of the royal family, they being members of the peerage too) to donate a horseshoe when first visiting the town. No one knows how this curious custom began, but it may have its origins in a pun on the name Ferrers (fer being the French word for iron, hence a farrier, one who shoes horses). The oldest horseshoe on the walls was given by King Edward IV in c. 1470, and the most recent come from current members of the royal family, such as the Prince of Wales. Odd as the ranks of overgrown ceremonial horseshoes look, there’s something fitting about this ancient building being the home of such a venerable and whacky custom. ‘Stop pointing, it’s rude.’ That’s how the great Irish writer Flann O’Brien sometimes responded to the pointing finger device used on signs and in typography to indicate something important, or to show us the way to a destination. O’Brien sometimes used the pointing finger himself, especially in his newspaper column when he wanted to draw attention to something in the editorial, which was usually across the page from the column he wrote, under the name of Myles na Gopaleen, in the Irish Times. Back in Myles’s day, pointing fingers were everywhere – they’d been popular with the Victorians, and remained common in the first half of the last century. We don’t see them often today, but here’s a survivor, above the steps to the platforms at North Ealing station in west London. I wonder if it has been there since the station opened in 1903. Back then, this suburban station was on the first above-ground section of London’s Underground to run electric trains. 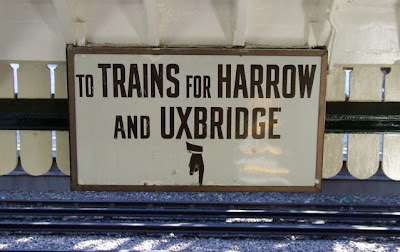 It was in the van of modernization, in other words, but if the electric trains seemed to look forward to a new age, the letterforms on this sign seem to look backwards to the time of Queen Victoria and steam railways. Compared to the elegant Edward Johnston signs that came to the Underground in the interwar period, this sign is no masterpiece of elegance. The tall condensed letters are slightly eccentric. The way the strokes of the S and G are cut off diagonally and the slight variations in stroke width in the R save them from being too heavy and blocky – or make them look odd, according to your taste. And the pointing finger, which has acres of white space on either side of it, has none at all below. It’s very much the standard signage of its time, in other words. The kind of thing one would see regularly on notices telling one to keep off the grass, or providing a hint of the day’s headlines. But the result is legible, and serviceable. A hundred years ago there must have been thousands of such signs. Most of them have disappeared on to rubbish heaps or into the homes of rapacious collectors of railway memorabilia (you know who you are). I’m glad this one is still doing its job, directing passengers to Harrow, Uxbridge, and the far west. The church of St Peter, Peterchurch is one of Herefordshire's outstanding Norman buildings. I hope to return to its architecture in a later post, but before I do, I would like to share something odd about this place. High on the south wall of the nave is this panel, apparently a plaster relief of a fish with a gold chain around its neck to which are added the names of some churchwardens and the date 1828. There were quite a few people in the church when I visited it - parents collecting children who had been doing Saturday-morning activities, borrowers using the library in the bell tower - for this is a very well used building, clearly a church at the heart of its community. But no one that I asked could account for the relief. Is it the portrait of a fish caught in the nearby River Dore? Is the golden chain a pun on the name of the river (d'or being French for 'of gold'?). Is it perhaps as P. Thoresby Jones speculates in Welsh Border Country, the only book I have that mentions the relief, 'a figure dedicated in gratitude after the ancient Greek fashion by some pious angler'? Or something to do with St Peter's trade of fisherman? Perhaps one of my readers can provide the answer. Since I posted this I've had several interesting comments about the fish. I'd assumed it was a carp, mainly because that was what Thoresby Jones called it in the book to which I referred. 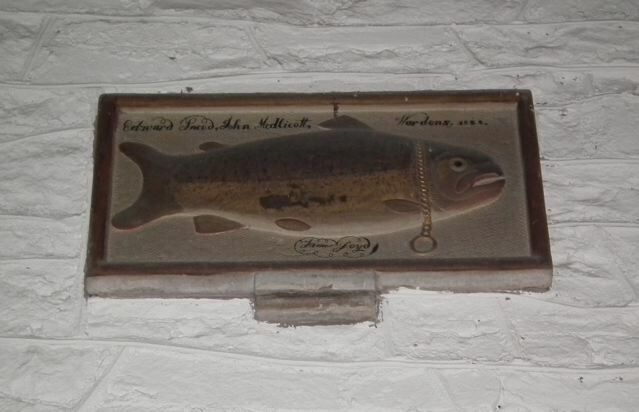 But a commenter on my post suggests that the relief represents a huge trout caught locally. Follow the Comments link below for more details.